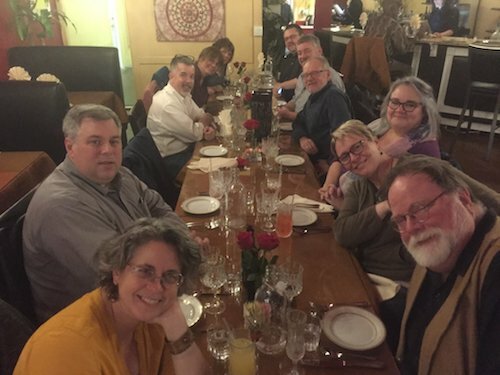 The February 2018 Portland Voiceover Meet-Up included Clockwise: Cindy McGean, Doug Rank, Peter K. O’Connell, Kim Fuller, Roberta Solomon, Kevin Cooke, Dan Nachtrab, Ulf Bjorklund, Emma Miles, Jen Gosnell, Sam A. Mowry. — with Cindy McGean and Emma Miles. Flying to Oregon for the first time was a pretty great way to kickoff February as I am now down to only 12 states I have not stayed overnight in. Even better was the fact that the Portland Voiceover Meet-up was getting together while I was there and they very graciously included me in the event. Voice actors and spouses Kim Fuller and Ulf Bjorklund put together this meeting to celebrate Ulf’s birthday! Of course getting to sit next to and visit with pal Bruce Miles at dinner was swell (he’s not in the picture because he took the picture) as was visiting with Dan Nachtrab (formerly of THE Dayton, Ohio). Jen Gosnell was there as was Sam Mowry who I feel like I’ve known for a decade or more but whom I really only knew virtually via the VO-BB.com. Roberta Solomon I had also never met – she told some great Dan Hurst stories because they used to compete in Kansas City radio (but are great pals). Kevin Cooke I had also not met – a nice guy! But chatting with shy, reserved, almost quiet to a fault Emma Miles (Mrs. Bruce….and she’s actually about as shy and reserved as I am…thus not much) was a super treat. I was really very, very pleased to be included in the evening. Equally, I was pleased to also grab a meal with my friend Nikki Lu Lowe – lots of marketing talk and laughs.